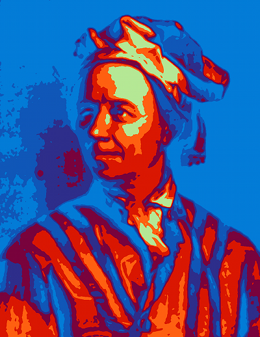 Leonhard Euler (pronounced 'oiler') was born on 15 April 1707 in Basel, Switzerland, but spent most of his life in Berlin and St Petersburg, where he died on 18 September 1783. Has was blind from the age of 50, but took this handicap stoically—when he lost sight in his right eye at 28 he said, "Now I will have less distraction". Leonardo and Galileo both worked on mechanical stress distribution in beams, but didn't have the luxuries of calculus or Hooke's law. Daniel Bernoulli and Euler developed an isotropic elastic beam theory, and eventually convinced people you could actually build things using their insights. Euler's equations of fluid dynamics pre-date the more complicated (i.e. realistic) Navier–Stokes equations. Nonetheless, this work continued into vibrating strings, getting Euler (and Bernoulli) close to a general solution of the wave equation. They missed the mark, however, leaving it to Jean-Baptiste le Rond d'Alembert. optics (also wave behaviour). Though many of Euler's ideas about dispersion and lenses turned out to be incorrect (e.g. Pedersen 2008, DOI 10.1162/posc.2008.16.4.392), Euler did at least progress the idea that light is a wave, helping scientists move away from Newton's corpuscular theory. He had full possession of his faculties and apparently all of his strength... after having enjoyed some calculations on his blackboard concerning the laws of ascending motion for aerostatic machines... [he] spoke of Herschel's planet and the mathematics concerning its orbit and a little while later he had his grandson come and play with him and took a few cups of tea, when all of a sudden the pipe that he was smoking slipped from his hand and he ceased to calculate and live. "He ceased to calculate," I love that.